IM Brazil - there was no plan to race this race in 2017! After a great first year racing in the professional category in 2016, I was amped for the 2017 season. Feeling stronger and fitter and more in the "right headspace" - I had done some great training over December spending many many many (and many more) hours on the bike - I loved it. My swim was starting to click, I was starting to understand the phrase "feel the water", and my running was strong. 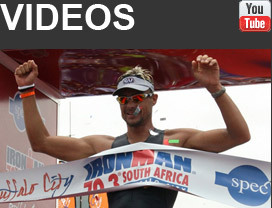 First up Ironman 70.3 East London. I love this race as it was the venue of my first triathlon and I still remember the thrill, the excitement and absolute happiness during the race. I recall singing along to the songs being played on the run and high fiveing spectators. I finished on such a high (because endorphins make you happy...) and was wondering when I could do this again - next weekend? Looking back to that race I could never have envisaged my journey in triathlon and becoming a pro a few years later. Racing in East London was a tough call for me as an aunt whom I was close with passed after a 4 year battle with cancer and it was her funeral over the race weekend. I had spent most of my December, if not on the bike, with her saying my goodbyes (more for me than for her). She always used to ask where and when I was racing so she could imagine me there - sending me good thoughts and wishes of wins. She was always proud of me and I was her "golden girl". So I made the difficult decision to race, focused, as I do in every race when I stand at the start line, on a podium position. After a dreadful swim, I had a sub-optimal bike due to some rookie errors - mostly the part where my bike sticker got stuck between my frame and my wheel at 20km's into the race and all I heard was ssssshhhhh for the next 70kms. I hit the run ready to race and I finished strong with a Top 5 placing but ultimately disappointed as I felt this race didn't reflect my training as sometimes races don’t. When I have a "crap” race, the big upside for me is when my coach, Raynard, speaks to me after the race and doesn't try and build me up. He gives it to me straight and direct and this honest hard hitting approach fires me up again. There is something special in Raynard and Natalie who continually believe in me, and know that I can race faster particularly given that I work full time and my pro career is sometimes a side line in my life. I realize I need to be more patient with my progress , which is difficult in an environment where we all demand instant satisfaction. It is tough to work hard and sometimes be disappointed with your race. IMSA - I was really looking forward to this race. I was in great shape and had worked as hard as I could and was relishing the challenge of racing against all the female pro’s that were coming to Port Elizabeth. It’s an awesome opportunity to race and perform against the best. I was as normal before the race, both excited and nervous at the same time. It is well known what happened with my race where I fell ill on the bike leg. For me it was the most dreadful position to be in as I have never had to stop a race. Subsequently, I have questioned whether I was actually that ill, was it that bad and could I have finished even if it meant going straight to the medical tent. I know that the emotional angst I place on myself is always far worse than anything physically I may have had to endure. With the disappointment of PE behind me, I knew I had to race soon ...as always Raynard and I strategized, what we needed to change to be more aggressive and stronger, and where I could race with a really strong pro field. That was when the South American IM championship came up and IM Brazil was on! Leading up to Brazil, my training has again gone well and mostly without disruption, though work has been far more challenging. I am changing career paths within the bank and am moving to Cape Town in early June –the relocation to Cape Town hasn't sunk in yet as I just landed back in SA yesterday. With all the training, the work changes and the autumn mornings kicking in, the lead up to the race went quickly and before I knew it, it was time to taper and fly off to Brazil. Leading up to the race the weather was wet – and I mean wet wet wet. It did not stop raining. The temperature and humidity was comfortable and varied by max 1 degree morning to night around a steady 20 degrees. Conditions were good and the field was truly classy, a proper IM regional championship field. Best description of the swim would be a two loop swim in the form of a "M" with an Australian exit (run along the beach after the first loop to start the second loop). At the start line all us pro ladies were in a heated discussion as to which buoy we had to first swim to and which was the first loop and the second loop. With the men pro field having gone off just before us, we had some indication as to what direction we were swimming to but before we knew it, we were in the water (it was wet start for us) and the starting horn was going off. The first 1km was chaos with an immediate and aggressive jostling for positions and swim lines. Over the following 1km it remained quite aggressive as the pro field attempted to position for the second loop. The Australian exit, a 70m dash of elbows, shoulder pushing and a sprint into the second loop kept the pace at a high level before settling slightly in the second loop. I was in the chase bunch but it was difficult to sight exactly the distance to the lead group. Exiting the swim it was a full sprint to get on the bike and ensure I consolidated my position and set myself up for the cycle leg. Of the chasing group, Linsey was first into transition, followed by Gurutze Frades and then myself followed by Sonja Tajsich, Pamela Tastets and Magali Tisseyre. This was also pretty much the order for the start of the run with the exception of Linsey whom was serving a time penalty (which I question whether correct). Sonja went out like a well feed race horse and Pamela was pushing ahead of me but still within close range. Here at Brazil IM, there are two mother climbs in the race leg . The first climb is at 4.8km and the second climb at 11.2km. This first fist climb is initially a steady climb and then a short and unbelievable vertical wall. In my pre-race recon I had considered that I could speed walk the vertical wall to save my legs as I didn't believe I would lose any time on it - and I didn't. Just after the 8km turn around point I passed Pamela and quickly I was at the 11.2km and into the real laps. Magali made an attack and was on my shoulder from about 14km's to 28km's, a real dual for supremacy. I picked up the pace and she eventually dropped back. At 32km's there was now one lap left. I was also having a war with my running shoes. It felt like the nail of my second toe had been ripped off. I was still pushing but had resultantly slowed down, and at 34km's Linsey made the pass. I changed down a gear to stay in range but before I knew it she had opened the gap… should have changed down a few more gears !. The last couple of km's on the run leg clicked by relatively fast although I would have liked to have been able to push harder without shoe problems. The final section of the run into the finishers chute is one of the best parts of this race with spectators going mad crazy, Brazilian style. Florianopolis - you guys rock ! We as athletes really appreciate the support particularly as all the spectators were standing in the rain the whole day to watch us racers do this crazy mad sport. A sport I just love love love … and sometimes hate!. The Brazil IM race was fast - really fast and I was blown away by the time of the leading pro man breaking the all time IM record. I always recall the wise words of my coach, Raynard, after I completed IM Barcelona last year, " there is no easy IM… there is fast and there is slow” and this was fast. And on that note, it’s worth remembering Daniela’s quote on speed… "going faster is nicer as the pain is over quicker! " After the results of IM Brazil, many have questioned the course distances and also drafting. My view on the distance is that I race to win and if I’m not wining I focus on getting as close to the winner as possible. I like an accurate course as it fits my disciplined approach to training and racing but it is not my primary concern. For those that are interested, based off my Garmin readings after the race, I recorded a swim distance of 3.8km, the bike at 180km and the run at s 41.6/7km. So there you have it from my race. It appears the run leg is c.400m short but with the first transition you run up from the beach to T1 - I stand to be corrected - I think this is c.300m. The second and more controversial question revolved around drafting. I cannot comment much on this point as I tend to never look behind me as I am completely focused on the race happening in front of me or and if I am leading I am pushing to maintain this lead. My personality is that I never show weakness by looking behind. At this race with the rain and wet conditions there is something to be said about watching where you are going on wet roads! IM Brazil is a great race. The Brazilian people are fantastic, Florianopolis is beautiful and the field is top class. It was an awesome opportunity and a good result for me. When I got onto the plane fair soon after prize giving, I had to reflect on my 7th placing. I am not happy but also not unhappy with my race. My takeaways are that I am definitely in the mix, I am making sure I position in the Top 10 of any race I have done as a professional.